I snagged this recipe from Kraft Foods. I haven’t made this yet but it sounds like a great party dish for kids and adults as an appetizer or dessert. Yum! Easy to double or triple and I’d probably cheat and just by a bag of sliced apples to make it even easier. Mix reduced-fat cream cheese, sugar and spice in medium bowl until blended. Stir in half the apples. 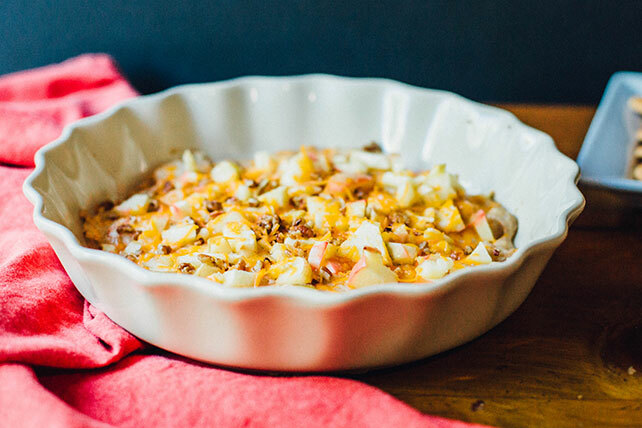 Spread onto bottom of shallow baking dish; top with remaining apples, cheddar and nuts. Serve with graham crackers, pita chips, cinnamon/sugar pita chips, Triskets, Wheat Thins, rice chips. This entry was posted in Writing Life and tagged family, food, holiday, recipe, Tuesday Treats. Bookmark the permalink.